Precision molded orifices feature accuracy comparable to jewel orifices at a fraction of the cost. Color coded for easy identification. The NV-30 series is a precision adjustable flow control used in pneumatic and fluidic systems. Nickel plated brass construction provides excellent corrosion resistance, and a clean and bright appearance. 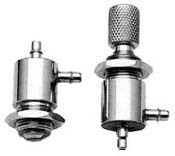 Flow control needle has 7 to 8 turns of precision adjustment, and maximum flow approximately equal to a 0.025″ orifice. Unique laminar flow design ensures sensitive, repeatable control. Perfect for use in application requiring precision gas metering, and circuit speed or sequencing control.